Gently peel away dead skin with our amazing Passion Peel Off deep cleansing masque. Our Pomegranate and Passion Flower formula cleans, purifies and protects leaving your skin feeling fresh and radiant. Gluten Free. Nut Derivative Free. No Added Parabens. Contains passion flower extracts rich in Vitamins C and A and potassium and pomegranate extracts, both of which have antibacterial and healing properties that leave skin clean, purified, and protected. Peel-off masks are a big weakness of mine - I haven't yet found one I don't like (okay, I did - an old orange peel off mask that left me looking like a wannabe Oompa Loompa) - and most of them do a pretty reasonable job at leaving skin looking fresh, probably because, sort of like scotch tape, they take off any loose dull skin from the surface. So anyway on one of my rare trips to Walmart, I found a bunch of masks by Montagne Jeunesse, and since most of them were the peel-off variety and quite inexpensively priced at a little over $1 each, I came home with a few a lot of these to try out. 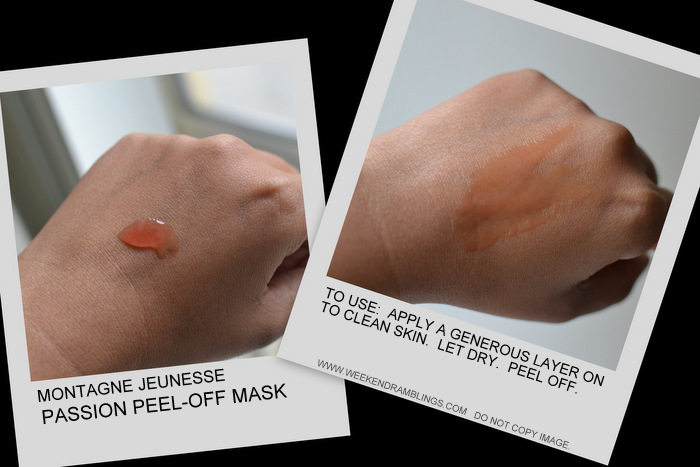 The one I have used so far - the Montagne Jeunesse Passion Peel-Off Mask. The Montagne Jeunesse Passion Peel-Off Mask looks and smells like some sort of fruit jelly/jam. Each packet contains a generous 1-time use sample. The mask is easy to spread, doesn't irritate my skin, and dries off in about 10 to 15 minutes. And yes, it does make my skin look at least a tiny bit fresher than what I started with. It does dry my oily-combination skin a bit - nothing a moisturizer cannot sort out - but my skin is a bit drier with the winter, and things might be different once summer comes around.